“Previously, it has been a get-together of businessmen. Today, it is a PR event,” says Daniel Flück of APG SGA, a Swiss advertising firm that sells space for Davos, Switzerland’s public bus company ads during the World Economic Forum. Advertising at the WEF is not ordinary advertising. In fact, with more than 2,600 world leaders and CEOs walking around Davos every January, the small town turns into a giant advertising space for countries. From traveling in Korea to investing in Azerbaijan—or even attending the Olympic games in Sochi—the huge posters hanging around the town advertise everything but the region where the summit takes place. The practice of countries advertising in Davos is called nation branding, described by academics as a form of global soft power. It aims to improve the country’s reputation, boost investment there and attract a skilled workforce. The lifestyle magazine Monocle’s annual soft power survey ranks Germany as first among nations that “best attract favour from other nations.” Another ranking, the Anholt-GfK Nation Brands Index, provided similar results in 2013. Most of the nations advertising in Davos are found at the bottom of this brand index. Printed on a large banner, the blue sky over India’s Taj Mahal looms over a small food stall on the street. Over a couple of stores, a long poster by the Russian bank Sberbank praises Sochi, the host city for this year’s Winter Olympics. Every few minutes, Azerbaijan rumbles past, as seen on a banner stuck to the length of the local buses. For several years now, Azerbaijan, Malaysia and South Africa have been selling their landscapes, natural resource reservoirs and investment climates to the world. This year’s newcomer to the economic elite is Mongolia, a country highly featured by the WEF’s strategic scenario team over the past year. 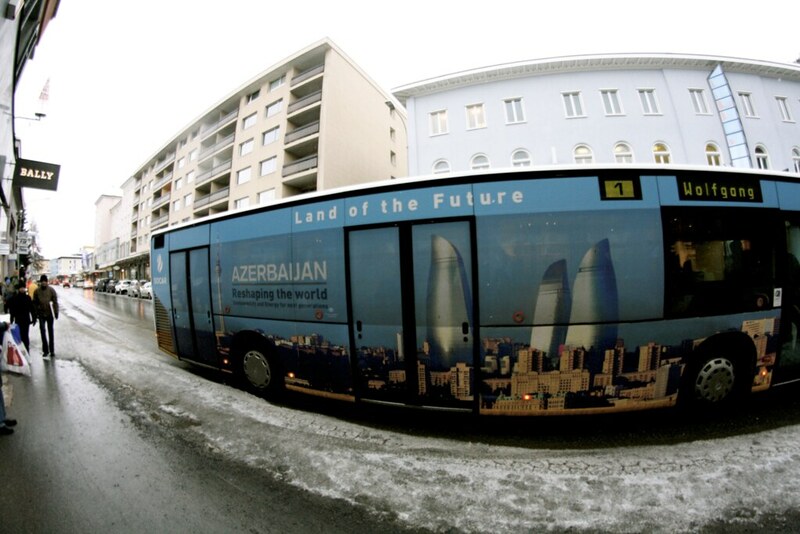 Azerbaijan takes over local city buses. View more images from our previous post. “You don’t find many platforms where you have so many people from different backgrounds … in one place,” says Sudhir John Horo, co-founder of theIdeaWorks, a design and strategy company based in New Delhi, India. For the past eight years, the company has been promoting India at the WEF in Davos but has also advertised other countries, such as Azerbaijan, Korea and Malaysia. Many of the larger companies at Davos focus on wooing participants with creative and sometimes luxurious promotional events. Thomson Reuters holds a ski day, and Aberdeen Asset Management opened a wine bar under its own name, hiring a bagpiper to stand outside. “I don’t know who they are, but if they’re serving nice wine and reach the top 1 percent of asset management and maybe get a client by serving some nice wine, then good for them. They’ve marketed to the consumer,” says Marcy Simon, a managing director at global PR firm Burson-Marsteller. Simon has run multiple campaigns at Davos over the years, including Thomson Reuters’. Advertising in private and public places is still supervised by the town. Luzi Probst from the town’s building department explains that local Davosers have to make a request to the municipality when they want to offer space for advertising. “[The ad] has to be in a context,” Probst says. As long as the ad relates to a country’s core message and not to a specific brand, the request is accepted. The fee paid to the municipality is 300 Swiss francs (approximately $335.20 U.S.). Today there are about 10 to 15 private ad spots in Davos, Probst says, and most of them are on the town’s main street, the Promenade. Apart from the ads in private places, posters on buses are managed by VBD, the town’s public transportation company. Fred D’Alberti, VBD’s manager, says the company made 120,000 Swiss francs ($134,000 U.S.) this year from these ads. The municipality chooses public spaces for larger ads as a way to manage how many ads cover the town’s walls. “We don’t want the entire landscape to be full of ads,” Probst says. Photo courtesy of KPMG Global. The outdoor corridor leading to Belvédère's entrance. Sitting next to the reception, Jill Lee, senior vice president of multinational corporation ABB, is surrounded by posters and company brochures. “It adds to the atmosphere,” she says. “There are a lot of guests in Davos, [and] there is no harm in creating advertising to make people aware” of the companies. Advertisements being taken down after everyone has left Davos. Tim Lehmann contributed reporting to this story. View more images from our previous post, “When the World Literally Takes Over Davos”. Apply: Be a Reporter for Coverage on "Organic Solutions in Global Food Affairs"